Know All About PayUmoney Web Checkout And Grow Your Business! Do you want a payment checkout that turns your customer’s shopping experience unforgettable? We have a happy news! PayUmoney’s web checkout is out and it is all set to turn your customer’s payment experience simple, fun and easy at the same time! What makes this stand out are its advanced features like re-directionless checkout, easy retry option, payment mode intelligence, and Nitro flow – for safe & automatic access to saved cards without login. All these combined gives you the best success rate! Read on to find more about PayUmoney web checkout and how it can be integrated into your website! What Is PayUmoney Web Checkout Payment Gateway? Let’s start with the basics, PayUmoney web payment gateway is a super fast and completely redirection-less checkout flow. If you are coming across the word ‘re-directionless checkout’ for the first time then it simply means a checkout flow that does not redirect your customers to another payment page. It enables your customers to make payments on the same page itself. This means the payment page will pop up as an overlay on the website itself, preventing redirection. PayUmoney web checkout is that seamless! Whom Is This Checkout Available For? Is optimized for all devices, be it mobile, tab, laptop etc. This means that 7 out of 10 people will leave your website after clicking on Pay now button. With PayUmoney’s web checkout, your customers never leave your website. It make it easy for your customers to pay online by reducing the number of steps they take to complete their payments. It is loaded with features that speed up your customer’s payment and this, in turn, lowers drop-offs & finally improves the customer conversion. One of the main features that contribute to its speed is Nitro Flow. Please note: Nitro is only available for cards that require 2-factor authentication (2FA) and not for International cards. When a customer is on the payment page and is about to make payment, our in-house algorithm, Payment Mode Intelligence arranges payment options in the order of his/her past usage. So, the payment mode most relevant to the customer is placed first. Say, for example, your regular customer Rahul prefers using UPI as his payment option. When he returns to your website to purchase a new product, Payment Mode Intelligence arranges UPI as the first payment option based on the frequency of his usage. This makes it very easy for the customer to complete the payment! According to our internal metrics around 15% transactions fail at the bank or 3D secure page. In that case, consumers will have to restart the entire checkout process. Even if there is a system or network error, your customers can retry seamlessly and land back on the payment page, with their details filled in. This is possible with the advanced caching technology that temporarily caches (saves) your customer data so they can re-initiate payment from where they left. Now, your customers can choose to pay from any of their preferred payment option like Credit Cards, Debit Cards, Net Banking, PhonePe Wallet, EMI, LazyPay, UPI & more. If you have a website built on E-commerce platforms, go for a payment gateway that is easy to integrate with no technical effort required from your end. It is now available for websites built on popular e-commerce platforms like WooCommerce, Magento, and OpenCart & Languages like PHP and ASP.net. We are actively working on rolling out web checkout experience for multiple plugins and platforms. We will keep you updated as and when we roll out the experience on new plugins. For further information or queries if any, you can reach out to PayUmoney contact . PayUmoney web checkout is designed especially to make your customer’s payment checkout experience simple & highly secure with all payment options! Join over 4.5 lakh+ happy businesses today! 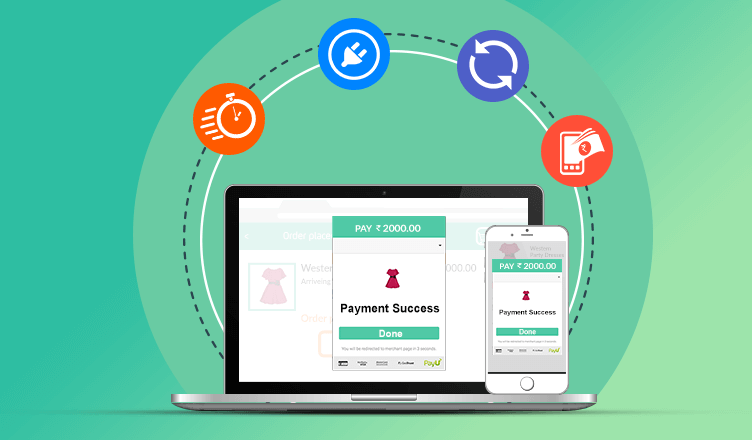 If you are an existing user, then continue using PayUmoney web checkout for smooth and easy business growth!